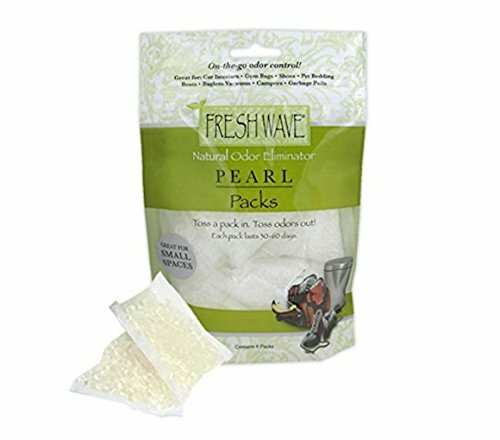 Perfect for active lifestyles, Fresh Wave Pearl Packs easily combat odors in gym or sports bags, lockers, shoes, even athletic equipment. Just drop one in wherever you need a boost of freshness and that distinctive sweat smell magically disappears. One sachet will keep things odor free for approximately 25 days. No matter the odor, Fresh Wave products provide an all-natural solution. Comprised of extracts of soy, lime, pine needle, aniseed, clove and cedar wood, Fresh Wave is biodegradable and non-toxic; perfect for the naturally green home. From the basement to the garage to the kitchen, you can eliminate odors virtually anywhere with Fresh Wave. If you have any questions about this product by Fresh Wave, contact us by completing and submitting the form below. If you are looking for a specif part number, please include it with your message.